I work for a news organisation where TV, radio and Online staff are located in different buildings. There is lots of talk about a multimedia newsroom, but it makes a lot of colleagues shiver. Social Media is used by only a few. To many, the power of Facebook and Twitter is overrated. 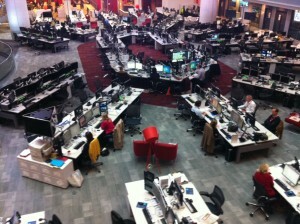 So coming to the new multimedia newsroom at the BBC’s New Broadcasting House was quite a culture shock. TV, radio and online journalists are all in one room and the social media activities are at the very heart of the action. While many BBC journalists have their own Twitter or Facebook accounts, there is also a dedicated Social Media team. A member of that team attends all editorial morning meetings, to know who is working on which story and to make suggestions. Social media journalists look at content that comes in and send information out. There’s a user generated content (UGC) team that looks at all things that the audience sends in, via email, comments on stories on the BBC website, or pictures and posts on Facebook, Twitter and other social media websites. This team takes the temperature of what’s happening on social media and what people talk about. Looking at the content they see, the journalists make an editorial judgment about what’s serious and relevant. They verify the sources of the content coming in. Once it’s cleared it can be used by all BBC media. Another example. The Conservatives in the UK say social benefits should be cut in order to help reduce the public deficit. The user generated content team will look for people affected. Contacts can then be used in all programmes. The fact that all departments sit next to each other, makes sharing that material so much easier, the UGC journalists say. There’s another team sending news out via Twitter and Facebook and Google+. These journalists sit right in the centre of the newsroom. That’s important to make sure that the content on all platforms is the same and that you can post a link to the most current angle of a story. Communication between departments is key and much easier in a multimedia newsroom, editors tell me. It reminds me very much of a newsroom at a news wire I used to work for. Journalists tweeting news for example on @bbcbreaking are a little bit like headline writers. Except that a tweet can be written in many different ways, it can be news only, it can be a question, it can be a teaser, etc. Every tweet needs a second pair of eyes. I think, because of Twitter, the BBC is now also a wire service. Not every tweet makes sense on Facebook. Content on the BBC Facebook pages looks and feels different. It will have fewer posts and more selected news, things that are more chatty, personal, a link to pictures that people might enjoy such as photos sent in by the audience. Facebook and Twitter journalism requires a whole new set of skills, I am told. That’s why most of the BBC staff have had social media training, to know what to write and what rules to follow in order not to risk breaking rules of balanced and impartial journalism. Better stories; being able to tell stories faster; having more contacts; being able to reflect more views; a better understanding of what the audience wants to know; reaching a wider audience; making young people interested in quality BBC programmes; saving money for the BBC by being more efficient; marketing quality news and making the BBC more accountable to the public. Click here to listen to an interview about social media with BBC World Affairs producer Stuart Hughes. | Charlie Beckett” was in fact a superb read and thus I was in fact extremely joyful to find it.